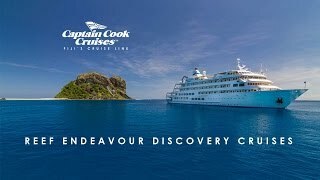 MV Reef Endeavour is an purpose-built small cruise ship catering to 130 passengers, with the intimate size ensuring that all passengers receive personal attention in an atmosphere of informality and relaxation. Comprising of a bedroom with separate lounge, chair, desk, LCD screen TV & DVD player, refrigerator, tea & coffee facilities and second bathroom. Located on the Upper Deck (A). Configuration: twin/double beds. Located on the upper and main decks, we offer 6 staterooms which can be connected an adjoining door for family accommodation. These Staterooms open onto the outside deck and have picture windows. Located on the upper and main decks (B & C), each room opens to the outside walkway and have picture windows. Configuration: twin/double beds. Located on the lower deck (D), cabins open to an inside passageway and have portholes. Configuration: twin/double/bunk triple/bunk quad.